Connecticut's shoreline, protected from the Atlantic Ocean by [li], is its most popular vacation region. The placid waters of Long Island Sound are perfect for swimming and pleasure boating. Lighthouses dot the coast, and the former whaling towns of New London and Mystic offer maritime enthusiasts numerous historical sites and museums. Among several wooden ships docked at Mystic Seaport is the three-masted Charles W. Morgan (1841), the only surviving wooden whaler in the US. Away from the water, many of Connecticut's attractions are steeped in New England heritage and traditions. In the Northwest Region corner of the state, the Litchfield Hills region features quaint inns built centuries ago, lots of antique shops, excellent fine dining, and picturesque farmlands, rivers, and hills. In the Northeast Region "Quiet Corner" of the state, many of the same attractions beckon, but the personality of the region is less moneyed and more rustic. 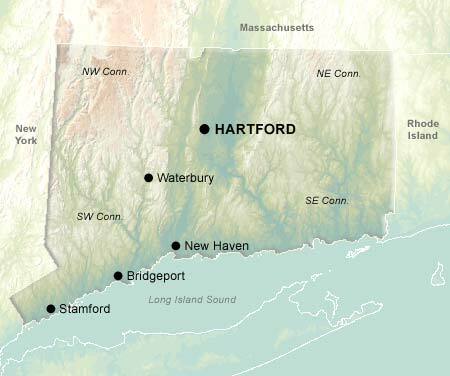 The Southwest Region corner of Connecticut differs markedly from the rest of the state, because it is so closely tied to New York City. At first, the area boomed as bedroom community for NYC commuters, but later, businesses began migrating out of the city and into the surrounding region, especially financial services, real estate, and insurance companies. As business development has intensified the communities have taken on a increasingly self-contained, urbanized quality.